Pixar Shorts 1: What if Lamps Had Feelings? On this episode we are talking about The Adventures of André & Wally B, Luxo Jr., Red’s Dream, Tin Toy, and Knick-Knack. We talk about whether bad people can make good art, whether women are objects, and why humans are so creepy. On this episode we talk about racial stereotypes, and Aunt May and Doc Ock’s romantic history, and what it means to adapt to fit the world. I hope this is the universe where you enjoy it! Fern Gully: Are There Australians in Australia? On this episode of WTS we’re talking about ecological propaganda, colonialisms, and unattractive love interests. On this episode of WTS we’re talking about archetypes of teen girls, the jungle as a site of colonialist imagination, and respect for endangered animals. On this episode we talk about representing systemic misogyny, yellow-eyed villains, and liking what you see in the mirror. Hockey Isn't a Movie. Is it? On this WTS we are stepping away from our bread and butter and talking about a hockey game instead of a movie. We cover toxic masculinity, ritualized aggression, and overpaid coaches. The Sword in the Stone: Too Many Arthurs! We’re talking about The Sword in the Stone on this episode of WTS. We cover American accents and why solitaire is for witches, and we ask who will speak on behalf of the wolves. On this episode of WTS we’re talking about Smallfoot. We cover strawman religions, violent humans, and whether ignorance actually is bliss. Mary Poppins Returns: 'Allo 'Allo 'Allo! On this episode of WTS we’re talking about Mary Poppins Returns. We touch on racist stereotypes, economic irresponsibility, and whether Mary Poppins is actually good at the job on her business card. The Princess Diaries: Abolish the Monarchy! In this episode we talk about makeovers, rivalries between girls, and abolishing the monarchy. In this episode we talk about mediocre parenting, emotion and reason, and retroactively sanitizing the past. In this episode of WTS we’re talking about How the Grinch Stole Christmas. We talk about ancient stories, empathising with the Grinch, and the true meaning of Christmas. In this episode of WTS we’re talking about A Charlie Brown Christmas. We talk about who therapy is supposed to benefit, perfect imperfections, and the true meaning of Christmas. The Princess Switch Or The Princess Witch? On this episode of WTS we’re talking about the Netflix original movie, The Princess Switch. We talk about love, romance, and the abolition of the monarchy. On this episode of WTS we’re talking about Ralph Breaks the Internet. We talk about solving problems through emotional maturity, fixing things in the sequel, and crushes. In this episode of WTS, we’re talking about Halloween favourite Hocus Pocus! That’s right, it’s a Halloween episode only a few days late! We talk about virginity, witches and virgin witches. In this episode, we talk about Spider-Man: Homecoming! We discuss whether this counts as a kids movie, what constitutes bad language and how old the aunt of a 15 year old should be. Annie: Who's Your Daddy Warbucks? On this episode of Way Too Seriously we are talking about 1982’s Annie. We talk about undifferentiated otherness, the calcification of gender roles and whether capitalism can be redeemed. In this episode of WTS we talk about gypsies, chain gangs, and boy stories. Muppets Most Wanted: Hey, a Sequel! In this episode of WTS we talk about flattening difference, myopic worldviews, and why all the female characters are in love with a frog. The Lion the Witch and the Wardrobe: Care for Some Turkish Delight? On this episode of WTS we talk about allegory, casual sexism in both the book and the movie, and who exactly the main character of this story is. This week we’re talking about a documentary: 2010’s “Babies.” We talk about truth in documentary film, misery tourism, and body positivity. We hope you enjoy! In this episode of WTS, we talk about Incredibles 2. We break down the world of parenting, villiony and stretchiness. On this episode of WTS we’re talking about Toy Story 3. We discuss Barbie’s political philosophy, Ken’s girly handwriting, and the metaphysics of identity as it applies to Mr. Potato Head. Toy Story: The Toys Are Alive! On this episode of WTS we talk about male whiteness as the standard, whether it was a different time, and the semiotic meaning of pop tarts. On this episode we talk about Harry Potter and the Prisoner of Azkaban. In this episode of WTS we talk about shrunken heads, fat shaming, and whether checking out your hair from the back is sexist. On this episode we talk about the 2017 live-action version of Beauty and the Beast. We talk about Disney’s First Openly Gay Character™, whether cross-dressing is hilarious, and whether the serving classes are morally responsible for their masters. In this episode we talk about kicking your characters when they are down, why mediocre movies are important, and optimism. We also talk about the “racial Bechdel test”, which we both forgot is called the DuVernay test, after Ava DuVernay, the director of this very movie! This episode of WTS is all about Harry Potter and the Chamber of Secrets. We talk about why nobody feels bad for Moaning Myrtle, why Hermione has nicer hair in this movie, and whether we should care about House Elf rights. On this episode of WTS we’re talking about Despicable Me. The first one. We talk about orphanages, child-endangerment, easily flattered women, and why Bee Gees dance parties are monstrous. On this episode of WTS we’re talking about Despicable Me 3. We talk about whether all women are naturally destined for motherhood, the male gaze, wacky ignorant foreigners, and whether child-marriage is funny. On this episode of WTS we’re talking about Boxtrolls. We cover Laika’s race problem, cheese as a metaphor for social privilege, and whether everything would be better for everyone if Mr. Snatcher could just be a drag queen. Paddington 2: They’re Listening To Our Podcast! Hi everyone! In this episode we discuss 2018’s Paddington 2! We get way too serious about judicial reform, maternal bravery and perfect sequels. Babe 2: Pig in the City - What Did I Just Watch? Hi everyone! We’re talking about Babe: Pig in the City this week. In this sequel to last week’s episode we talk about the surrealness of Babe: Pig in the City, Mrs Hoggett’s new accent, city life vs country life and the ethics of monkeys in wigs. In this episode we talk about “Babe.” We cover animal husbandry, the assumption of male as default, and whether it’s ok to eat an animal as long as you’ve never actually heard it talk. In this episode we’re talking about a movie that was called Leap! in the United States but Ballerina everywhere else! We talk about how just because someone kisses you that doesn’t mean she’s your girlfriend, VICTOR. We also cover competitive female relationships, and how passion and talent don’t always go together. This episode of WTS is all about the Studio Ghibli classic: Totoro! In this episode we talk about environmentalism, ignoring the rules of narrative structure, and why Granny should not be your childcare role model. In this episode we temporarily turn away from movies and talk about Calvin and Hobbes. We also talk about Beethoven, Cersei Lannister, and why you shouldn’t tell a little girl that a little boy is picking on her because he likes her. On this episode we talk about the horror of Victorian poorhouses, whether it counts as passing the Bechdel test when the “woman” is a pig voiced by a man, and why if Tiny Tim doesn’t make you cry you’re a monster that’s right I said it. In this episode of Way Too Seriously we’re talking about The Nightmare Before Christmas. Jan and Paul don’t quite see eye to eye about this movie. We disagree about whether this is a Halloween movie or a Christmas movie, whether Oogie Boogie is troublingly racialized, and whether Sally is a protagonist or a flat support character. In this second Halloween-themed episode of WTS Paul and Jan talk about Hotel Transylvania 2. We talk about infantilized women, incompetent men, and loving children for who they are. In this episode of WTS Paul and Jan talk about Moana. We talk about how trauma affects identity, whether Maui should have been a skinny guy, and why the best romantic subplot is no romantic subplot. In this episode of WTS Paul and Jan talk about Cloudy With a Chance of Meatballs 2. We also talk about the evils of hero worship, why it matters if you confuse an ape for a monkey, the moral argument for veganism, and why the workers must seize the means of production to overthrow capitalism. In this episode, all about Cloudy With a Chance of Meatballs, we talk about adapting picture books to movies, why a girl can’t be both cute and smart, and why fat people in movies are evil. In this episode we talk about why it’s good to feel your feelings, whether fairy tales are colonialist by nature, and how overprotective parenting can harm children. In this week’s WTS Paul and Jan talk about Hook, representation, why every female character wants to kiss Peter Pan, and food fights! Walking With the Dinosaurs 3D: "Hey Look! A Full Moon!" Jan and Paul are watching a movie this week that they didn’t choose. You don’t have to have seen this movie to listen to the episode: we’re talking about Walking With the Dinosaurs 3D. We talk about mating habits of anthropomorphized animals, whether a movie about dinosaurs should be considered a nature documentary, and whether dinosaurs wear lipstick. Inside Out: What if Even Doublemint Gum Can’t Make You Smile? Jan and Paul return to Pixar to talk about Inside Out. We talk about depression, explaining theories of mind to children, and whether it’s possible for a bus driver to be a complete human being. In this episode of Way Too Seriously, Jan and Paul talk about Prince of Egypt. We talk about how nice it is to hear Patrick Stewart in anything, about whether it’s all cool to give women as gifts (spoiler: it’s not), about white actors playing African characters, and about why 2D traditional animation was great. In this episode of Way Too Seriously, Jan and Paul talk about Toy Story 2, even though they’ve never talked about Toy Story. Oh well. We talk about why holding on to your childhood is tempting but futile, whether toy dinosaurs can be girls, and whether it’s ok for a villainous character to be racist. 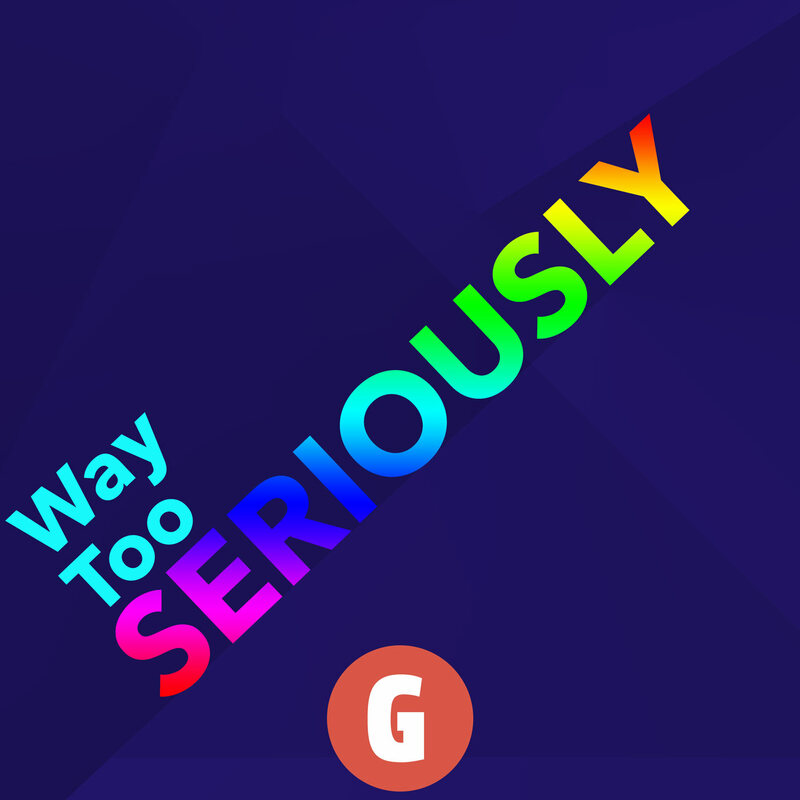 In this episode of Way Too Seriously, Jan and Paul talk about The Wizard of Oz, how passing the Bechdel test really should be easy, whether Munchkins are better than Hobbits, and whether it’s better to be a friend of Dorothy than to actually BE Dorothy. In this episode of Way Too Seriously, Jan and Paul talk about Megamind. We express our sympathy with Dreamworks for always being the runner-up, this time to Despicable Me. We also talk about why Roxie is a love interest for every male character in the movie, whether the fact that Megamind is blue makes him count as a person of colour, and Brad Pitt and the nature of privilege. In this first full episode of Way Too Seriously, Jan and Paul talk about Hotel Transylvania, the insidious idea of fathers owning their daughters, how love at first sight is a terrible concept, and why disability is not monstrous. In this intro episode to Way Too Seriously Paul and Jan introduce themselves and the idea for this show. See you next Friday for our first full episode!